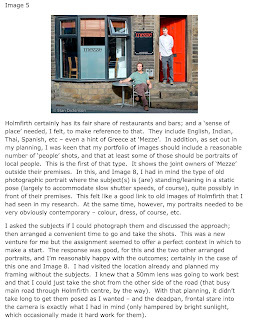 “You probably think of your photography as essentially a practical or technical activity.” So reads the first sentence introducing this project in the course notes. Actually, I don’t! And I don’t tend to describe my photography “... in the form of technical notes ...” or “... become absorbed in the particular technical problem ...” that is facing me. So, from my own perspective, I have to question the premise behind the exercise! Having read a fair amount of serious photography criticism over the last few years I think that I have moved on from that technical focus. To be fair, though, looking at the title of the project made me reflect on some of the descriptive aspects of the critics that I have come across. One in particular certainly opened my eyes to the effectiveness of a descriptive approach when looking at photography. That was Michael Fried who’s Why Photography Matter as Art as Never Before (Yale University Press 2008) I read a couple of years ago. It was a tough read at the time, and I certainly didn’t ‘get’ all the theoretical references to the likes of Heidegger, but Fried’s descriptive approach to analysing images did make an impression; and it helped me fully appreciate the work of Jeff Wall, Thomas Struth, Luc Delahaye, Andreas Gursky, Thomas Ruff, and others about whom he writes extensively in the book. More recently, I have read Criticising Photographs: An Introduction to Understanding Images by Terry Barrett (McGraw Hill 2012). Chapter Two is entitled ‘Describing Photographs: What Do I See?’, and in it, Barrett says, “The starting point is not crucial, but accurate description is an essential part of holding defensible critical positions.” (Page 18). He compares various critics’ approach to descriptive writing – making particular use of three pieces of writing about Avedon’s ‘In the American West’; and discusses description of Subject Matter, Form, Medium and Style. Although it isn’t particularly referring to description, I like the quote from John Szarkowski, in which he says, more or less, that the simplicity of photography arises from the fact that it is very easy to make a picture, but its ‘staggering complexity’ lies in the fact that a thousand other pictures of the same subject would have been just as easy (from ‘Looking at Photographs’). I do feel the need to express some surprise that in this latest new edition of the book, published this year, his section on describing the Medium lists the kind of information that might be included without any reference at all to digital media! I was pleased, though, that he selects one writer as a particularly ‘careful describer’ of what he sees – Michael Fried – and includes a typical piece from him, looking at one of Mitch Epstein’s ‘Power’ series. Barrett stresses the importance of keeping descriptive writing relevant to the writer’s interpretation – not description for its own sake. But, importantly, he stresses that “... descriptions are rarely value-free.” (Page 40) and that “Description is not a prelude to criticism; description is criticism.” (Page 41). 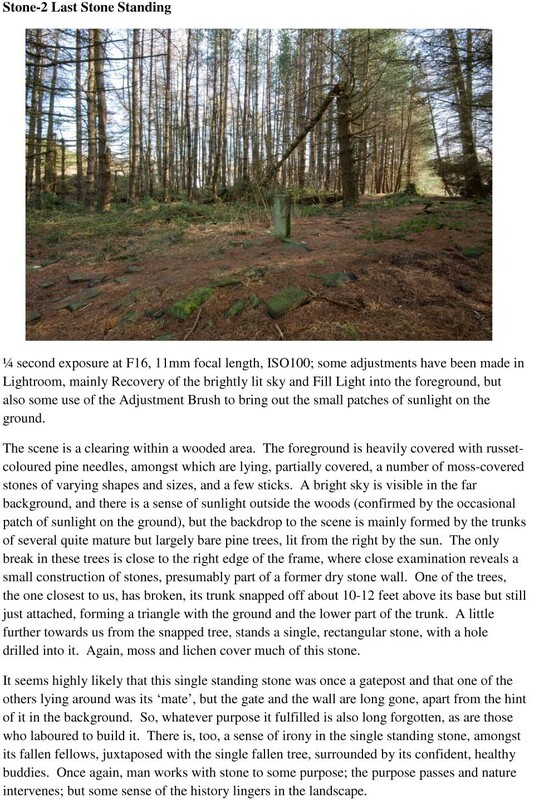 The ‘technical’ aspect is kept to a minimum and that hefty second paragraph makes up a detailed description of what is, on the face of it, a relatively unspectacular woodland scene. It does read as though it might have been written by Michael Fried! Barrett observes that Fried is very concerned with Form, and my own description definitely focuses that way in the second paragraph. I think it falls over a bit on the ‘relevancy’ criterion, though. I was more concerned with a thorough description than with the final paragraph, where I get into the purpose and ‘meaning’ of my image. Interestingly, I’ve gone for very little actual description. There is very little technical information either. The writing covers context – of both the ‘place’ that is being depicted and the assignment itself – and process – the ‘how I went about it’ and ‘why’. Does that represent progress in my writing about my own images? I’m not entirely sure – the first, as I said, sometimes lacks relevance, but the second maybe lacks the form-based description of Fried. 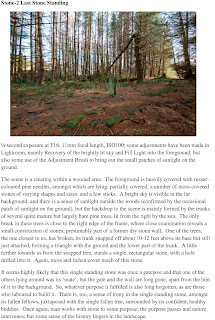 It may also reflect a differing approach to the assignments – the first being part of a conceptual series called ‘Stone’, whereas the second is for an assignment based around the notion of an article for a ‘serious’ travel magazine. The difference if worthy of note, whatever its origins. So, I have chosen not to do the actual exercise titled ‘Writing descriptively’ but the re-examination of my own writing from previous modules has been useful, as has the reading of Barrett and the reminder of Fried’s descriptive style. Writing about photographs interests me, as does reading about it, so I approach the rest of this section of the module with a degree of enthusiasm.